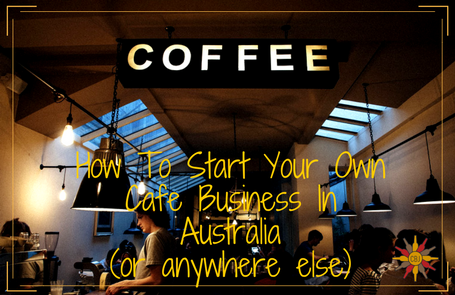 If you have a passion for coffee, sweets, pastries and other cafe treats and are interested to know how to start your own coffee shop business in Australia, you’ve come to the right place. The idea of setting up your own cafe is a good one as there’s never a lack of demand for places that people can hang out in. Of course, there are still some things you have to consider, such as location, legal requirements, expenses, pricing and menu, among others. Don’t worry – we’ve got all you need to know to help you get started. Even the best and most populated commercial strips can have dead spots, so make sure you do your research first before signing a lease (or buying property) in an area. What you need to look for are foot traffic, accessibility and parking, proximity to “complementary” businesses and services (such as co-working spaces where people run on caffeine) and of course, the lack of competition. You wouldn’t want to put your cafe on a street where there’s another coffee shop three doors away. This is a case-to-case thing too of course. Competition is good in a sense, particularly if the other coffee shop is one of those big chains and you want to offer a homegrown alternative. But if you think that coffee shop is going to make it hard for you to survive the first year, it may be better for you to look elsewhere. Assuming you’ve already got your brand identity all figured out, your next challenge is to come up with an ideal cafe design and layout that will create an atmosphere that complements your brand concept and what makes your cafe stand out. It helps to be aware of other coffee shops and how they integrate their own brand image into their interiors so you’ll have an idea of how you may be able to do yours. The design of your cafe is crucial for drawing customers in (and making them take photos for sharing on social media!) and enticing them to return. It’s really important that the coffee shop design concept you’re working with not only suits your brand image but also appeals to your target audience. From your storefront design to your in-store layout and color scheme, decor, menu board and other elements, all of these should work together to create your desired look and feel. Espresso coffee grinders – coffee is best made from freshly ground beans. Coffee grinders help you get grounds of consistent size for a proper cuppa. It’s ideal to have at least two conical burr grinders – one for decaf and the other for regular espresso beans. Having one commercial coffee grinder is also recommended so you can serve customers who want their coffee plain, simple and black as sin. 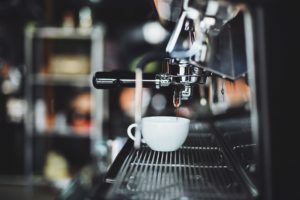 Espresso machines – espresso machines help you create a varied menu comprising mochas, cappuccinos, lattes and similar espresso-based drinks. Coffee brewer – you will likely still serve regular drip coffee, so a brewer is a definite must-have. Commercial blender – to better make frappes and other frozen espresso-based drinks with, my dear. Water filtration system – to make sure that your water quality is top-notch. Avoid using mineral water because it will have an adverse effect on your espresso machine. POS system – a POS system for restaurants will help you complete transactions quickly and easily. The newest POS systems feature easy-to-use touch-screen interfaces and can be customized and updated regularly to include new menu items as well as daily specials. There are also tablet-based systems coupled with traditional cash registers for a more streamlined order-taking and sales reporting. The coffee shop menu is one aspect you can be flexible with, especially at the beginning when you’re not sure what will sell. The general rule is to keep the menu simple – there’s no need to offer a lot of “good enough” or mediocre items when you can impress your customers with just a winning few. You can start with a limited menu of basic yet tasty offerings with a creative twist, then add any new items or extras as the opportunity or demand presents itself. You can also ask your first customers for feedback regarding your “soft opening” menu so you can improve on some items, consider removing others, and come up with something entirely new. If there are enough requests for a coconut-flavoured coffee, then by all means make that a regular fixture on your menu. Plus points if it’s an item no one else has, or no one else can do with such perfection. Aim for an enticing, memorable menu that will make customers come back for more. Next to your customers and staff, you should be able to establish a good working relationship with your suppliers. When you find good, reliable and consistent suppliers, you need to work hard to treat them well and make your payments on time. If something goes wrong in the supply phase, your entire business will be crippled. Imagine a coffee shop without quality coffee beans because you’re several months behind on a payment. The first few months may be a bit of a struggle – let your suppliers know you’re just starting out so you can adjust and make the payment terms more favourable. Stick to your end of the bargain and if you can, pay your suppliers before the due date. This will put your business in a good light and your suppliers will appreciate your timely payment. Additionally, make sure you work with your suppliers about adequate lead times – how many days or weeks they need to fulfill orders so both of you can come up with a realistic timeline of ordering, payment and delivery. Keep them abreast of how you are doing so they can share in your coffee shop’s progress. Making them feel part of your growth is a great motivator to continue working with you. And that’s it for our coffee shop business basics. We hope you find these pointers useful in making your dream business come true!